Time flies when you are in Barbados! We had an awesome time, but before we knew it, it was time to get back on the plane and back to reality! If you have the chance to go, I highly recommend that you go. If you do go, make sure you take in a few of the local landmarks. The first one we went to was an absolute delight. Hunte’s Garden is a tropical paradise with too many beautiful plants and flowers to mention. Here are just a very few of the photos I took…..
Another great place we visited was Sunbury Plantation House, a 300 year old house filled to the brim with antiques and a room devoted to sewing machines…. ….and an antique quilt that caught my eye! Of course, I checked out the back! It was hard to tell how big the hexies were (none of us had a ruler!) but they are smaller than the ones I am working with. The pattern was a little random, a little planned. Of course, I found time to do a bit of stitching. So now, back to the routine of sitting down to hand-quilt in the evening with a nice pot of tea! Hubby and I and 2 other couples are leaving on Sunday for a week in the sunny south. We have had this holiday planned for a while now and we are all very, very excited. Who wouldn’t be? We are going to Barbados! The other 2 wives are busy planning where we will be eating, daily excursions to must-see tourist areas and flight schedules. Not me. I am too busy prepping my applique so I can do some serious stitching! My biggest fear is that when I travel, I will have absolutely nothing to do. True story. So I always take my applique with me wherever I go. I have stitched in Nova Scotia…. …The Royal York in Toronto. We actually missed our flight to Nova Scotia so I had lots of time to stitch while we waited for the next flight. …on the Amoeba in Antigua….. Wherever I go with my stitching, I take my bag with me. I pack this bag before I pack my suitcase. Again…true story! My bag has everything in it that I will need….thread, a package of needles, a few pins, scissosrs, close-up glasses, Thread Heaven and ThimblePads. So…on to the border. I love fabrics that go from light to dark across the width, like this purple one. I needed some purple berries to finish off the bouquet in the vase and I thought this might be the perfect fabric. I cut a few dark berries, a few medium ones and a couple light ones. I just kept adding flowers, buds, leaves and stems, until the right side was complete. Voila! 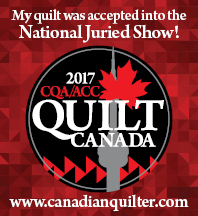 Finally, I have something to hand-quilt! I spent the weekend marking and basting my Grandmother’s Flower Garden quilt. I decided to quilt a Baptist fan design. So far, so good! I have noticed the squirrels are gathering their nuts for the winter. My friend (who know all about that kind of thing) tells me that means we are going to have an early winter. Darn. Here is the 6th block of “To Everything There Is A Season”. These blocks are available for purchase on my website Simple Bird Studio. I love to have lots of projects on the go. It keeps things interesting. I am in the process of putting the finishing touches on my Grandmother’s Flower Garden quilt. So…here are all the flowers stitched together. And I have started to fill in the side sections. I must admit it is a little awkward stitching with a cat lying on my lap, but somehow I manage! Next, I started filling in the top and bottom sections. Just one more row to add on the left side and I will be finally ready to start hand-quilting. I have been without a hand-quilting project for some time and I am can’t wait to start!